I hope you've enjoyed my postings for the TJ Blogstravaganza over the last 2 months - I've enjoyed sharing my creations with you. 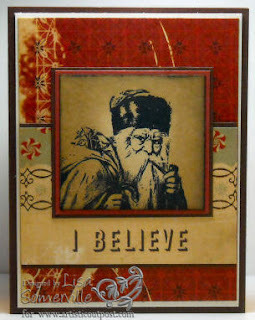 Today, I leave you with my final card for the season - I've used the Santa image from the Artistic Outpost Snowy Woods plate, along with the Burnt Edges Technique. The sentiment is already printed on my Designer Paper by Cosmo Cricket. From my house to yours....Have a Merry Christmas! Such a cool card, Lisa!! Thanks Lisa for an inkspiring Holiday ride! It has been awesome enjoying your work everyday. I don't see how you do it, beautiful artwork, every day....we are all so blessed to have you. You've been a faithful blogstravaganzan (mouthful! lol) this season, Lisa. I've enjoyed all of them, and this card is a wonderful one to end with. a great way to end the season..hope you and your family have a great holiday. Wow, Lisa! This is just beautiful! I have enjoyed your beautiful Christmas posts and your always wonderful tute's!